I've heard all the stories about there being a problem with bees disappearing in the world. And we need them for the entire food chain. So I'd just like to point out that we here at Badger Creek Farms, are doing our part to encourage the bee population. The little suckers are everywhere! every...where. They like us. A lot. And we like them. A lot. Until we start getting stung. We don't love that part a lot. 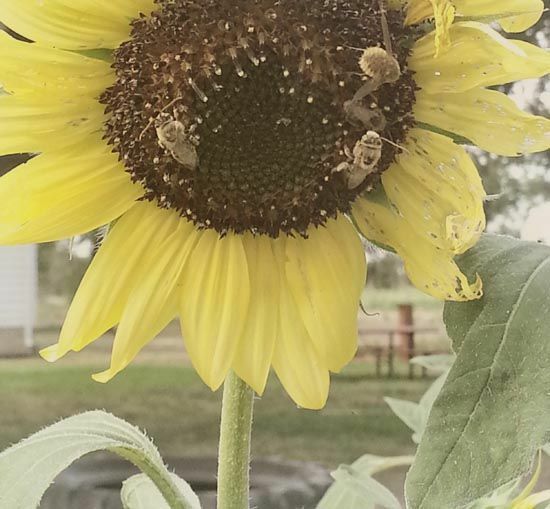 But it really is cool sometimes to look at one of my sunflowers and see like 7 or 8 bees in the center! And I have tons of sunflowers for them! Tons of other flowers too. We went a little flower happy this year. Just a quick shot I took with the Samsung Galaxy S3. Sometimes I haul my big camera around. But sometimes I just reach in my back pocket and grab my phone. I did play around and edit it a bit to make it funky. Maybe someday we'll get totally crazy and harvest honey. We'll just continue to buy it at the local health food store. Do you see very many bees near your home? we have bees too. lots. We planted sunflowers this year and they have been loving them. We have a butterfly bush and another blue flowering bush and the bees are crazy around it! I'm glad that these are far away from the house because I don't do well with bee stings. As in pass out. As in ER. Hurray for bees that pollinate! Tons of bees here- oh could it bee that we have a bee hive!!!! ?